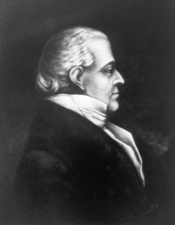 WRIGHT, Robert, (cousin of Turbutt Wright), a Senator and a Representative from Maryland; born at Narborough, near Chestertown, Queen Annes County, Md., November 20, 1752; attended the common schools and Washington College, Chestertown, Md. ; studied law; admitted to the bar in 1773 and commenced practice in Chestertown; served in the Revolutionary War as private, lieutenant, and later as captain; member, State house of delegates 1784-1786; member, State senate 1801; elected as a Democratic Republican to the United States Senate on November 19, 1801, for the term commencing March 4, 1801, and served until his resignation on November 12, 1806, having been elected Governor; delegate to the Farmers National Convention in 1803; Governor of Maryland 1806-1809; clerk of Queen Annes County 1810; elected to the Eleventh and Twelfth Congresses to fill the vacancy caused by the resignation of John Brown; reelected to the Thirteenth and Fourteenth Congresses and served from November 29, 1810, to March 3, 1817; unsuccessful candidate for reelection in 1816 to the Fifteenth Congress; elected to the Seventeenth Congress (March 4, 1821-March 3, 1823); was not a candidate for renomination in 1822; district judge of the lower Eastern Shore district of Maryland from 1823 until his death at Blakeford, Queen Annes County, Md., September 7, 1826; interment in the private burying ground of the DeCourcy family at "Cheston-on-Wye," Queen Annes County, Md. American National Biography; Dictionary of American Biography.